If you are looking for gorgeous-looking cloud forms, pannus clouds fall short. Still, your collection of cloud formations will never be complete without this cloud type. Now, let us delve into some interesting facts and features of the pannus cloud. In addition, find out what type of weather condition it signifies. Pannus clouds are clouds that have a shred-like appearance that occur with a parent cloud which may be separated or attached to it. As this cloud type is an accessory cloud, this means it depends on the parent cloud for its formation and continuance. Pannus cloud is so named as Latin word pannus means “patch of rag or cloth” which appropriately describes this cloud form. Pannus cloud is responsible for giving the sky a threatening appearance. In fact, they are often referred to as messenger clouds because rainfall may occur within five minutes of their emergence. How do Pannus Clouds Look Like? These clouds appear in grey or dark hue and usually move rapidly all over the sky and change shape quickly. They are characterized as broken layers or sheets of dark frayed clouds. When they contain a considerable amount of moisture, pannus clouds exhibit a completely opaque color indicating rainfall within several minutes. Pannus cloud may appear in several forms depending on the cloud layer with which they develop. 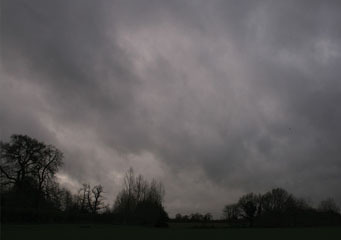 More often, these clouds develop under rain-bearing clouds such as nimbostratus, cumulonimbus, cumulus, and altostratus. Pannus cloud is commonly seen under nimbostratus clouds which make the sky more threatening. Their ragged appearance is due to the turbulent and unstable atmosphere in the cloud layer and may grow alongside nimbostratus. Pannus under a cumulonimbus cloud appears as dark cloud shreds at the base of cumulonimbus. If you see a pannus cloud developing under fair weather cumulus cloud, it signifies that a bad weather system is advancing. Intense turbulence in the cloud layer as dampness build up from evaporating moisture induces the development of pannus cloud at the base of altostratus. At What Height is Pannus Clouds Found? Pannus cloud is a low-lying cloud and appears in vertically developing clouds such as cumulonimbus, cumulus and nimbostratus. It can also be found with altostratus clouds. With this, pannus clouds can be found at elevations not higher than 9,000 feet from the ground. Snowflakes and raindrops can also fall from them. How do Pannus Clouds Form? Pannus clouds form as a result of strong and turbulent winds at the cloud layer which give them a shredded or ragged appearance. They may break off or form within the parent cloud and disappear during heavy rainfall. How common are Pannus Clouds? Pannus clouds are very common all over the world - in the polar, tropical and subtropical regions. They are also commonplace on hilly or mountainous areas and appear as shreds or wisps of low clouds. Pannus clouds may bring heavy rainfall or snow but not severe thunderstorm. Pannus clouds may not be one of the pretty-looking cloud forms but they are useful indicators that rainfall or snow shower is about to drop within several minutes.